Note that different results may be achieved with different brokers. Read more here. Testing commenced 13 March 2017. Public reviews here. NB: From 17 July 2017 customized settings used in an effort to increase monthly returns . Our testing of Forex Real Profit EA was not all on default settings for the whole time period of testing. From 13 March 2017 to 17 July 2017 default settings and currencies were used on our demo account. The system was showing a small profit of about 1% per month during this time but this profit would not have been as much on a real trading account due to market fills being worse on a real account vs the demo account. From 18 July 2017 to 8 February 2018 custom settings and currencies were used with increased risk settings in order to try and improve on the default settings and currencies. Unfortunately, this resulted in the system producing a loss during this time. Overall, the system made 261 trades, 154 were winners and 107 were losers. The beginning demo account started with $5,000 on 13 March 2017 and finished with $4,967.32 on the 8 February 2018, just one month short of a year of testing. FRPEA software functioned perfectly over our time of testing with no known failures of any kind. It is also good to hear that a new improved strategy has come out from the beginning of 2018. Brainyforex verdict about this system is that it is worthwhile giving it a try with recommended settings and currencies and a ecn broker account with low spreads / no spreads. The right choice of broker and account type is essential for any chance of success. Testing started 3 July 2017 and finished 18 September 2017. Default settings. GBP/USD M5. Important note from developers : Rocket is a fully automated trading strategy designed to deliver high returns. However, with high returns comes high risk and we recommend to either withdraw profits on a regular basis or move profits to another trading account. Brainyforex testing of Rocket EA started on 4th July 2017 with $3,000.00 demo money account. This system is a grid trading system that can produce many profitable trading days in a row until it gives up all those profits and more due to big market moving days which don't retrace. This is the main problem with grid traders - they will catch you out unexpectedly by unexpected large moves and that is certainly what happened with Rocket EA. Within two weeks our account lost the initial $3,000.00 due to just one bad day. Another $3,000.00 demo money was added and a nice recovery was taking place until the market had a big bullish move in the British Pound which caused one trade to be in a floating negative amount of $800.80. The equity balance was $1,287.16 and with such a big draw down it was time to call it a day for this system. The final stats was 331 total trades, 163 winners and 167 losing. 22 Winning days and only the 2 unprofitable days that lost most of the accounts balance. The developers have since changed the trading strategy to make it a lot safer, but I still need convincing that grid trading systems can work over the longer term? It is recommended to watch their live trading account to see if they can make some long term profits trading it? They do recommend that the system is not just left to accumulate profits but rather to withdraw profits on a regular basis so as to reduce risk. Can this be done? Guess it depends if you get a good clean run of a string of profits before the big losing day comes? As for our brainyforex testing, we got hit with a few large market moves early in the piece so we did not have a chance to accumulate decent profits. The first time it made about three hundred dollar before it lost most of its balance and then the second time it accumulated profits of about a thousand dollars. The developers do say its a risky trading strategy and in our case it was a good thing that we were using a demo money account. Default settings used. M15 EUR/USD, GBP/USD & USD/JPY. Testing commenced 14 March 2017 and finished 22 June 2017. Read review in Public reviews here. We ran Wallstreet Forex Robot 2.0 Evolution on a IC Markets demo account for 100 days. From 14 March 2017 to 22 June 2017. The default settings were used. We started the test with $5,000 and ended with a balance of $4,831.95. That being -$168.05 loss overall. The robot made 102 trades with 73 being winners and 29 losers. The average win amount was $10.53 and the average loss was $32.29, with average trade length 4.4 hours. EUR/USD $180.12 profit with 85% win rate. GBP/USD -$431.70 loss with 58% win rate. USD/JPY $83.53 profit with 85% win rate. Overall the software performed faultlessly also providing warnings when the Metatrader VPS terminal was functioning poorly. For example when trade opening or trade closing was taking too long to execute. Over the period of the test this did happen from time to time with my VPS service and if I were running this EA on a real money account I would have to make sure this issue was taken care of. My VPS may have contributed a little for sub-optimum results that were achieved? It is interesting to note that both EUR/USD and USD/JPY both achieved a 85% hit rate with a profit and GBP/USD performed so poorly in comparison. For anyone interested in buying this EA, it would prove handy to check out the prior years performance of these three currencies with the view of only running EUR/USD and USD/JPY? This can be done through myfxbook by analyzing the prior year results for each currency through the custom tab. Brainyforex started testing on 1 September 2016 on demo account with IC Markets. Jared's live account is through FX Choice on his myfxbook account. Read more about brainyforex's progressive review here. Testing for this EA ceased on 13 March 2017 as CovertFX has not produced any profit since testing started six and a half months ago on 1 September 2016. IC Markets demo account. Total loss for period was -$1,740.21. It made 557 trades, 283 winners and 274 losers. Tested for six and a half months. Two of those months showing profits and the others loses. It was observed that this EA has the ability to recover losses if the market moves in it's favor. It is worth watching the vendors independent third party verified live account to see where it goes from here. As it normally goes, since testing finished a few profitable trades came through. If trading results pick up from here it would mean that Brainyforex's testing was during a drawdown period and this EA. If it can manage some 100% profitable months due to market conditions it may be worth purchasing if you can handle larger type of drawdowns without stressing out. Brainyforex testing 19 December 2016 to 13 March 2017. Brainyforex can confirm that the live trading results produced by Inertia Trader EA on their third party verified account at myfxbook are reported accurately. Our testing started on 19 December 2016 with a $1,000 demo account with IC Markets and ceased on 13 March 2017 with $726.50 balance. ie a -$273.50 loss for the period. 64 trades. 19 winners and 45 losers. Unfortunately brainyforex testing was during a drawdown period BUT our main objective was to verify that the results as shown through myfxbook were those produced by Inertia Trader EA. Even though this system has produced a loss for the prior three months it still may recover from these losses and produce profits into the future. It is worthwhile to continue to watch how this EA performs. If it does do well over the next 6 months I will purchase a personal copy. During testing the program functioned well and setup was straight forward. The upsell currency GBP/USD did produce a profit of $80.24 (26 trades) ie 8% for 10 weeks as I added GBP/USD in early January 2017. I also noticed that this system has the ability to recover fast once it gets a few winning trades. Overall, I look forward to watching it's future performance as I think it may have potential? I have limited space on my VPS and hence need to put other EA's on test so testing finishes for this system. Brainyforex can confirm that Jared Rybeck's real live account results shown on his website are the real deal. Even thought this test was run on a demo account, it provides proof that the live results shown by Jared through myfxbook are correct and trustworthy. The software performed well with no issues and Jared responded to emails in a timely manner. Brainyforex tested this EA for about 5 months. (146 days). Started 12 November 2014 with $5,000 and finished on 8 April 2015 $5,292.46. (Demo money). This EA is currently being run on a public live account at myfxbook. The public results and brainyforex results have been very slow for the prior several months but we recommend keeping an eye on the future results for this EA through the above myfxbook link. Brainyforex has confirmed that the results shown through myfxbook are true and legitimate. Brainyforex's experience using this EA has been very good. The software was reliable and stable. Doug is honest in displaying all his trade results through myfxbook (ie no hidden fields as some vendors use). Also, support questions were answered promptly and Doug keeps in contact with his users advising when to turn off the EA due to impending high impact news announcements or when making changes to currency pairs being traded. Summary of brainyforex trading statistics as follows; After 146 days. Net profit 5.8%, 64 winning trades, 38 losing trades. Nov $151.67, Dec $595.60, Jan $173.33, Feb $(-86.42), March $(-476.31), 1st week April $(-65.41). This grid trading system just could not handle the market moving down in a big way for 5 days straight. All it's accumulated profits and starting balance ($9,006.80) was lost in one day on the 8th September when the market opened down again after the weekend. Very large non-trending market moves do happen on occasion and these situations create huge problems for grid trading systems as we have seen with Forex Warrior EA. This scalping EA holds trades from seconds to minutes has been successfully traded on brainyforex IC Markets demo account. This account was used with recommended default presets with 15 charts. Opening balance on 15 July 2013 $3,000. Closing balance on 13 March 2014 $4,338.70 being net profit of $1,338.70 for 242 days. There were 7 winning months and 1 losing months. 37 winning trades and 26 losing trades. ie Overall 44.6% Profit, being 4.6% monthly profit. Forex Kinetics EA will only work on the lowest or no spread ECN brokers with the best possible VPS latency speed. A second account was also tested using 3 charts with the bonus presets. Default settings used. This account was tested at the same time for 253 days. Showed 13 winners, 19 losers for a net profit of $234.73 on the $3,000 account. 3 months were profitable and 5 months unprofitable. Overall 7.8% profit, just under 1 percent monthly. Account #1 Broker ICMarkets Demo account same as real account. Recommended default presets used with 15 charts. Account #2 loaded with bonus presets using 3 charts. Brainyforex tested this EA for 242 days. Opening balance 7 January 2013 $10,000 closing balance $177 on 5 September 2013. Made 845 winning trades and 423 losing trades. Net loss -$9,823. 4 currency pairs tested. Eurgbp +$2,221 profit, Eurjpy +12,002 profit, Eurusd -$16,449 loss & Usdchf -$7,559 loss. Broker ThinkForex Demo account same as real account. Brainyforex tested this EA for 218 days. Opening balance 31 January 2013 $500, closing balance $509 on 5 September 2013. Made 79 winning trades and 101 losing trades. Net profit $9 (+26 pips). Broker SynergyFX Demo account same as real account. This extreme short term scalper EA was successfully tested at brainyforex on IC Markets demo account. Only works on nil or low spread brokers with the fastest VPS latency speed. Only holds trades a few seconds. The risk settings were dramatically increased from 0.005 to 0.02 half way through testing to push it's limits. It traded very well starting on 6 July 2012 $3,000 to 16 April 2013 $17,157.20 closing balance. Being net profit of $14,157.20 over 285 days. 471.9% overall profit, being 20.5% monthly. Made 107 winning trades and 115 losing trades. 7 months winning and 3 losing months. Broker ICMarkets (demo). Note : Demo account and real account are the same for ICMarkets. Now 0.02 risk per trade instead of default 0.005. Brainyforex tested this EA for 149 days. 4XATM would make a reasonable amount of profit but only to lose it again with one or two bad trades. As shown on the results below, it traded consistently for long durations but then once the market trended in one direction for too long it caused all profits to be lost. Broker ThinkForex. Note : Demo account and real account are the same. This scalping EA which holds trades from seconds to minutes has been successfully traded on brainyforex FinFx demo account. Opening balance on 15 January 2013 $3,000. Closing balance on 2 May 2013 $3,438.48 being net profit of $438.48 for 108 days. FX Capitalist EA will only work on the lowest or no spread ECN brokers with the best possible VPS latency speed. Brainyforex tested this FREE EA for 2 months. (20 November 2012 to 28 January 2013). In that time it only made 2 trades for a profit of 38 pips being $41. Opening balance $3,000 and closing balance $3,041. Brainyforex has now moved onto testing the paid version of FX Capitalist and is showing great results. Hence stopped testing the free version. Broker IC Markets. Note : Demo account and real account are the same. Brainyforex tested PipJet for 131 days. Starting balance was $3,000 on 12 July 2012, with closing balance of $2,673.03 on 3 December 2012. Over the 4 months the EA lost -$326.97, making 51 trades being 35 winning and 16 losing. Tested on IC Markets whereby demo and live data feed the same. Ceased testing because after 4 months the results were poor. It's strategy of taking very small profits with a large stop is just not a good trading method. Brainyforex is unhappy with this trading strategy. Read the details why here. Broker SynergyFX (demo). Note : Demo account and real account are the same for SynergyFX. Look forward to testing this system on a larger money account with zero spreads. Read more about our review here. Unique algorithmic system using mathematical formula with no technical analysis. Three strategies (core units) based on EUR/USD 30 minute chart. Take a look inside the Thor system here. Real money results Non-ECN FinFX.fi account through mt4i.com. Note : SynergyFx ECN demo account same as real account. Read about the specific details on the review page here. Tested for 62 days (2 June 2012 to 6 August 2012) with very poor results. Thinkforex demo account started with $50,000 and finished with $869.09. Read about the specific details on the review page here. Successfully traded at brainyforex. Made 22% over a period of 310 days. Read about the specific details on the review page here. Tested on Think Forex demo account for 61 days. (31 Jan 2012 to 20 March 2012). Opening balance $5,000. Closing balance $4,495.00. 78 winners, 103 losers for loss of -$504.90 with -322 pips lost. Decided to cease testing this automated trading software because after 61 days showed no signs of recovering with the above statistics. Strategy that trades five currency pairs on 15 minute chart. Tested on demo account for 41 days. (10 Dec 2010 to 28 Jan 2011). Opening balance $10,000. Closing balance $9,981.62. with two floating trades of $638.20 loss outstanding. 2 losing trades, 2 open trades. Average length trades open was 871.17 hours. Decided to cease testing this automated trading software because after 41 days it was not going anywhere. The losing trades were open too long for my liking. Tested on demo account for 93 days. (27 October 2010 to 28 Jan 2011). Opening balance $10,000. Closing balance $8,243.50. 18 Winning trades, 19 losers. Average length trades open was 2.13 hours. Decided to cease testing this forex robot because after 93 days it was slowly going backwards. With a 50% hit rate and same win and loss amount the future profit of this robot seemed questionable. Tested on demo account with for 81 days. (2 November 2010 to 28 Jan 2011). Opening balance $50,000. Closing balance $126,700.29. 25 Winning trades, 0 losers, 1 floating with $24,090.87 profit. Average length trades open was 29.51 hours. Decided to cease testing this forex robot on demo because after 81 days it had racked up 25 straight winning trades with no sign of slowdown. Incredible system designed by Angela Adams. Currently running 2nd demo test on mini account with FinFX. The second demo account showed that the 225 pip stop loss did not activate with the default settings. Looks like there is a major problem with this trading system. I thought there may have been a problem that I may have created setting it up that caused the stop loss of 225 pips to malfunction. Not so! Another forex review site has had the same problem. The forex review site believes that PipsGeek developers programmed it so that there is no stop loss in an effort to increase its accuracy rate. This goes to show that it is important to test forex robots thoroughly on demo accounts first with different account balances for a reasonable length of time. I have tried to contact the developers with no response from them. At this stage view PipsGeek as a MAJOR PROBLEM! (Nice way of saying scam). Tested on demo account for 86 days. (4 November 2010 to 28 Jan 2011). Opening balance $10,000. Closing balance $10,114.42. (includes floating trades). 548 Winning trades, 110 losers, 15 floating with -$8,166.63 loss. Average length trades open was 28.38 hours. This robot was demo tested for 86 days. During that period it consistently produced a profit of 22.7% each month after waiting for losing trades to recover into profit. The system opens many trades at a time and holds onto the losing trades until they turn around into profit or large stop loss is activated. I have no doubt that the 15 floating trades that were left open when I took it off demo testing would have bounced back as had most of the other ones over the testing period. This robot has shown that it can perform with the best of them, however it does worry me that so many losing trades are left waiting for a recovery. A lot of margin and patience is required to trade this automated trading software. ForexGeek blew up a trading account on a another forex robot review site. Setup on demo and real money account. Decided to stop real money account on the 15 June 2011 until strategy amended for fast moving market. Kangaroo EA V6.2 has a problem coping with a "continued falling or rising market". The strategy keeps opening positions one after the other as the market continues to stretch in one direction. The problem has been that when the market does not retrace, Kangaroo EA ends up with a string of losses that wipes out a lot (or most) of its prior steady gains. I believe the developers of this system should be able to find a solution to this problem and I will restart the live account a bit later on in time. This system was achieving consistent profits of about 15% per month until big unexpected moves took place which the news filter could not prevent. (The news filter was designed to prevent the robot from trading during fast market conditions). Overall, happy with everything about this system and developers except for this one issue. The real money account uses risk setting of 2 instead of default level 5. Both pairs were set to trade consecutively. Brainyforex is not currently testing Kangaroo EA but may resume testing in the future. TulipFX says that the stats go back over 14 months so will show some nice history on a real money account and show how well Kangaroo can trade on a live account. As you can see here, Kangaroo did well over 100% return in 2011 and is up 140% since Nov 2010. Tested on demo account from 4th February 2011. This EA is advertised as a robot that can double your account every month. Unfortunately, so far in its 57 days of demo testing it has reduced a $10,000 account down to $9,506.89. The problem has been that two large stop loss have been hit within the 57 day time period. Each loss is set at 330 pips. This has caused the robot to remain unprofitable as take profit targets have only been 16 pips average. It will be a long road to recovery at this rate. Have also noticed that there are regular problems with the failure for the system to re-start after disconnection problems with the software. On 29 September 2011, ceased testing LeoTrader due to poor performance. As shown in the graphic below after 244 days the loss was 107.19. The system had a 93% win rate with 104 profitable trades and 8 losing trades. Unfortunately, each winning trade was small and each losing trade was large (330 pips). Traded this system on demo account from 7 October 2010 starting with $10,000 and ceased on 16 May 2011 (219 days) with $8,774.27. This system traded extremely well for the first three months and then fell from grace with a few bad days. Can see that the problem with this system was when market moved quickly in one direction and did not retrace. As it's a volatility based system it looses all its profits when the market stops moving sideways, which does happen about three to four times a year on average. Very sad to see this system fail after consistent winning periods. Brainyforex Review explains how it works here. This system is still in active testing as it is consistently doing well. . It must be run on a MICRO account due to money management reasons. MIG BANK forex broker with brainyforex's altered money management settings. Tested system using lot size of 1.00 instead of 0.01. (1:500 Leverage) (Non-recommended classic account instead of micro account). Software interface recognized risk and issued warning. Result was huge gain followed by huge loss. 2nd account with MIG BANK, different account type with brainyforex's altered money management settings. Tested system with non-recommended 'mini account' instead of 'micro account' lot size of 1.00 instead of 0.01. (1:200 Leverage). Forex Bulletproof has now been taken off demo test and will no longer be tested. The history of this robot was that it was placed on a $10,000.00 demo account and produced small but consistent gains. The profits were very small compared to the initial deposit of $10k. In order to improve results the systems default settings were doubled. The software gave warnings that this was above the recommended risk level. The profits generated were more reasonable with the $10k account but in the end some large losses ended this robots testing at brainyforex. See the statement below for the string of large losses. The end analysis for this robot is that it seems unable to cope with large moves that do not reverse. A common problem for a lot of robots. New lots are continually opened in an effort to recover prior losses. When these big fast moves take place that do not reverse then that's when the robots small consistent profits get wiped out very quickly. EUR/USD from 0.09 lots (default) to 0.18 lots. USD/JPY from 0.01 lots (default) to 0.10 lots. This system must be run on the lowest spread broker possible along with fast latency VPS service. This means that the VPS service and broker should be located as close as possible. [If spreads are too high and latency speed is a problem the software will issue warning messages to this effect but may still try and place some trades]. Tested on real money account through Finfx.fi (non-ecn account) from 15th to 20th September 2011. Produced 28 trades of which 3 were profitable and 25 were losers. Loss of $85.01 on the $488 account. The software program reported that there was a problem with the speed of trade execution (latency) between broker and vps provider. The recorded speed was 142ms. This was a problem on my side of things because my vps host is located in America and broker in Finland. For best VPS and broker speed it is best to have both as close as possible. Million Dollar Pips EA is programed with a 5 pips stop loss. There were several losses of 12,13,15 and 16 pips which should not have occurred. This means that the problem was due to either too high spreads on my Finfx account or the speed of execution or a combination of both. This EA is now being tested through Thinkforex.com broker. Looking at a different selection of review sites around the world it looks like this EA is very successful on the right combination of low spread broker and fast VPS connection. Tested on two demo accounts for several months. Final test was from 26 September 2011 to 14 November 2011. 45 days with a net loss of -2.9%. System made profits followed by equal loses on a consistent basis. Looks like a safe trading strategy was employed but just did not produce a growing account. Trades EUR/GBP & USD/CHF 15 minute. 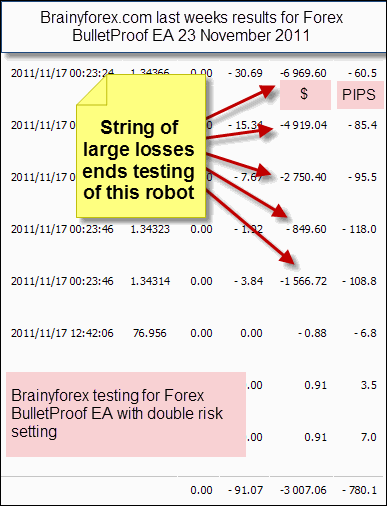 Brainyforex tested this robot from 15 November 2011 to 18 January 2012. (About two months). The robot placed 62 trades with 28 winners and 34 losers. Average trade time was 28.7 hours. Overall lost -376.4 pips. Haruea system was always moving backwards and forwards between profit and loss. The programming was solid but the strategy was let down by a string of losses after it made some profits. Brainyforex hopes Haru will come back with a stronger strategy and we look forward to helping him redeem this two month losing patch. Trend trading system that combines fibonacci and moving average strategy. 4 stars. Brainyforex tested Primeval EA for 66 calendar days. From 26 October 2011 to 30 December 2011 on demo account - Alpari UK. Primeval was run on 10 currency pairs, cadchf, eurcad, eurchf, eurgbp, eurusd, gbpcad, gbpchf, usdcad, usdchf and usdjpy. It made 658 trades of which 527 were winner $57,931 and 80 were losers -$27,893. ie a 80% win rate with $30,038 net profit. Profit factor being 2.08. Primeval had 8 losing trading days and 29 winning trading days overall. Brainyforex rating for this robot at 4 stars. Real account test has not been done and it looks like the developers have stopped selling this robot? It's original sales page no longer exits. If anyone knows any information where this robot is being sold, please tell us know. Due to a large number of forex robot review sites throughout the world being unable to achieve similar number of trades / or profit the following robots are placed on the 'extreme caution' list. Go to Public Robot Reviews for Fap Turbo here. Go to Public Robot Reviews for Forex megadroid here. Too many bad results from review sites all around the world. If you have used this robot in the past or currently, please submit some comments about it at brainyforex's Public Robot Reviews Page. This system seemed to die a slow death, until owner did not bother with it anymore! After independent third party results went bad, the system was stopped and nothing more has been heard! Visit full review page and see independent third party results - click here. Hard to obtain third party results for this robot. One review site that traded many different currency pairs with it ended up with no real change in the account after five months. I believe this robot is suppose to only trade the EUR/USD pair? I have not had a reply to my email from the owner. Visit brainyforex tested automated trading systems results with feedback from us after testing here. IF you feel your system appears here unjustly, please contact me so that I can set it up to test it and report the results publicly. Brainyforex is all about helping traders work out what works and what does not. With so many forex trading systems available on the market today, brainyforex has no need to be biased in its reporting. We tell it like it is. Developers are encouraged to ask me to run their robot and post the results for all to see here.